Over the last week, more than 200,000 Brazilians have taken to streets of the country’s largest cities to protest what they see as gross injustices in their country. The demonstrations, which started over a bus-fare increase in the city of São Paulo, have brought together people from across the political spectrum who want the government to spend less money on stadiums for the 2014 World Cup and more on improving public services, including schools, hospitals and public transportation. The protesters have also called for the defeat of a proposed constitutional amendment that would take away the investigative powers of public prosecutors, who have investigated corruption cases against public officials; control of inflation, which has pushed up the price of food and housing; and the ouster of Marco Feliciano, a preacher who was recently named chairman of the congressional Commission on Human Rights and Minorities despite declarations that many see as racist and homophobic, among other demands for political and social change. The breadth of the demands made by Brazilian demonstrators is reflected in the latest Pew Research Center poll of Brazil, which finds that 55% of Brazilians are dissatisfied with the way things are going in their country, even as 59% give national economic conditions a positive rating and 74% say their personal financial situation is good (although at least 70% see rising prices, lack of job opportunities, the gap between the rich and the poor, and public debt as very big problems in Brazil). 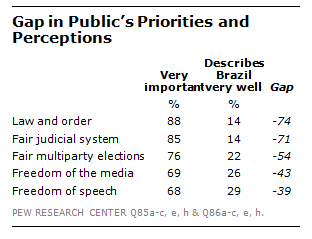 The survey suggests that Brazilian dissatisfaction is, at least in part, the result of a large gap between what the public considers top priorities for the country and perceptions of how well these priorities are met. For example, while 88% of Brazilians say it is very important to them to live in a country where law and order is maintained, just 14% say this describes Brazil very well; 85% believe it is imperative for the judicial system to treat everyone in the same way, but 14% say the Brazilian justice system does this very well; and narrower but substantial gaps also exist between expectations for and perceptions of Brazil’s electoral system, freedom of speech, and freedom of the media.